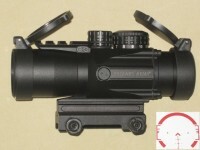 Primary Arms 30mm advanced red dot sight, black. Features: Battery Life: 14000 Hours&n..
Primary Arms Gen II 3X Compact Prism Scope - Illuminated ACSS 7.62x39 / 300BLK CQB Reticle, new. Fe..
Primary Arms advanced micro red dot sight. Features: Approx. 50,000 hour battery life ..